We’d love your help. Let us know what’s wrong with this preview of Jesus by David Fitzgerald. To ask other readers questions about Jesus, please sign up. Like an addict, I keep going back to this topic. I still find it utterly astounding how little evidence there is for the historical Jesus. Shocking I know. If you are happy in your faith or not confident it can withstand scrutiny, don’t read any of David Fitzgerald's books on the subject. Too risky. I lost my faith in the Bible and Yahweh but still assumed there was a religious guy named Jesus walking around in the first century. But then I read David Fitzgerald’s first book on this subject: “Nai Like an addict, I keep going back to this topic. I still find it utterly astounding how little evidence there is for the historical Jesus. Shocking I know. If you are happy in your faith or not confident it can withstand scrutiny, don’t read any of David Fitzgerald's books on the subject. Too risky. I lost my faith in the Bible and Yahweh but still assumed there was a religious guy named Jesus walking around in the first century. But then I read David Fitzgerald’s first book on this subject: “Nailed: Ten Christian Myths That Show Jesus Never Existed at All” with skepticism. I read it as a lark, the same way that I watch flat earth videos on youtube now. I expected it to be an atheist kook book. But then it wasn’t. It was so compelling because it rang true and the religious responses seemed so tenuous. Josephus & Tacitus they scream. Hmm… But I digress. I listened to this book on audio and I loved Fitzgerald’s narration. He doesn’t sound like he’s reading. He laughs when it’s appropriate. He’s just an entertaining reader (and writer). These books are very digestible compared to some of the other books in this field. By comparison, I find Richard Carrier’s book compelling but he’s too high brow for me. I have recommended Fitzgerald’s “Nailed” as a good intro to this topic because it is so approachable. This first volume of David Fitzgerald's "Mything in Action" is quite an eye opener. The author draws on the trail-blazing research of a growing cohort of Jesus scholars along with some of his own original research on the historicity of Jesus. He builds the argument that there never was a real person called Jesus. His argument is rational, solidly supported, and well written. Highly recommended! Fitzgerald is not a Bible scholar, so take this book with a grain (but only a grain) of salt, the same way you'd read a science book written by someone who's a science popularizer rather than a scientist. Although the view he presents, that Jesus Christ is entirely mythical, is far from mainstream, it seems defensible. For one thing, as he takes pains to explain, entire field of Bible studies tends to attract people who already believe that Jesus is real, and is thus biased in that direction. But Fitzgerald is not a Bible scholar, so take this book with a grain (but only a grain) of salt, the same way you'd read a science book written by someone who's a science popularizer rather than a scientist. For one thing, as he takes pains to explain, entire field of Bible studies tends to attract people who already believe that Jesus is real, and is thus biased in that direction. But if scholars like Bart Ehrman, Richard Carrier, and Robert Price can be believed, and I think they can, solid historical evidence is in very short supply. This book offers good evidence that much of the New Testament is based on older writings, of other people, casting more doubt on there ever having been an historical Jesus. Rather, there were a number of actual and mythical people the story was blamed upon. The author gives a great deal of scholarly credence, with evidence, that many of the canonical gospel was forged much later than believed - some even into the third century. Oddly, some of these forgeries contain warnings to look out for forge This book offers good evidence that much of the New Testament is based on older writings, of other people, casting more doubt on there ever having been an historical Jesus. Rather, there were a number of actual and mythical people the story was blamed upon. The author gives a great deal of scholarly credence, with evidence, that many of the canonical gospel was forged much later than believed - some even into the third century. Oddly, some of these forgeries contain warnings to look out for forgeries! This book is one that every free thinking person should read. It's packed with relevant information regarding many biblical events and most certainly puts the life of Jesus in the fictional category. I personally found it difficult to put down. Pretty good read detailing specific scripture verses and the improbability of the verses. Mr Fitzgerald also ties New Testament verses with Old Testament counterparts to show the blatant plagiarism in the Bible. I would have given him 5 stars if he would have refrained from political snark. Meh, 6 paragraphs into a response and I got bored trying to hack thru the linguistic minefield of this topic. My thoughts on the matter are irrelevant so let's just blurb the book. Amusing book, give it a listen (go for the audiobook). Also: Mildly annoyed it got split into three books. 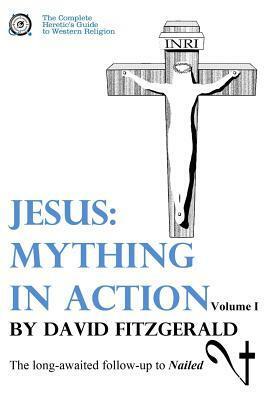 David Fitzgerald is a writer and historical researcher who has been actively investigating the Historical Jesus question for over ten years. He lectures around the country at universities and national secular events and is best known for his book NAILED and THE COMPLETE HERETIC'S GUIDE TO WESTERN RELIGION series. He is also the co-author of the science fiction trilogy TIME SHARDS with his wife, Dan David Fitzgerald is a writer and historical researcher who has been actively investigating the Historical Jesus question for over ten years. He is also the co-author of the science fiction trilogy TIME SHARDS with his wife, Dana Fredsti.